Sometimes one small thing can make a big difference, especially in relationships. The key is knowing what small things to focus on. While there are plenty of differences between men and women, there are some ways in which we’re exactly the same. I’d like to share one of those with you today. And I’ll even show you how to use this information to supercharge the connection with your guy. This is a small thing with a big payoff. But first, let me ask you a question. Think about the last time you changed your hairstyle or wore a new article of clothing for the first time. I’m not talking about a dramatic change. Just something subtle, though still noticeable. When you left the house that day, were you hoping someone would notice the change? Of course you were. As nice as it is for people to compliment us on big things, it’s even nicer when someone notices the small stuff. It means they’re really paying attention. In a way, those little compliments are the biggest, best compliments we can get. And small compliments are even better when they speak to who you are as a person. When, for example, someone notices how gracefully you handled a sudden schedule change even though they know it really bothered you. Or the way you always greet them with a smile. Or how you refuse to allow another person’s foul mood to bring you down. These are little things that tell a story about your character. You may think men are different. You might think they don’t care about little compliments. Maybe you got that impression because they seemed unfazed by a compliment about a new tie they were wearing, or a new pair of shoes. But small compliments about his character will mean a lot to him. This is one of the ways men and women are exactly the same. Watch for the less obvious things about his character, like the gentle way he interacts with children, or his pattern of being consistently on time. 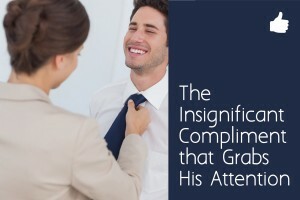 When you compliment him on something small, especially something that speaks positively of his character, he’ll feel just like you feel when others do the same for you. Noticed. Appreciated. Even cherished. Of course, like so many things in a relationship, putting this to work requires a bit of finesse. Don’t go overboard pointing out every little thing you can think of. Instead, lightly season your conversations with this special breed of compliments. He’ll know you’re paying attention, and he’ll feel validated and appreciated. Being observant is a great way to show your affection because it opens the door for better communication while ensuring that he knows you’re invested in him. The next time you notice something pleasant about your guy, tell him. Anyone can compliment a new shirt he’s wearing. But only someone who really pays attention will notice the kindness in his eyes when he talks to a child. Or the way he pauses to take a deep breath of fresh air, followed by a smile, each time he steps outside. Notice the little things that others miss. Show him you’re paying attention. It may be something very small and seemingly insignificant you mention. But sometimes those are the most powerful compliments of all. P.S. in this article I highlighted one small thing that can make a big difference. But I want to hear about your experiences too! Was there ever a time when one small change led to a big improvement in your relationship? If so, I’d love to hear about it. Click here if you don’t mind sharing your story with others. This entry was posted in Communication, Relationships and tagged communication, complimenting men by James Bauer. Bookmark the permalink. I havee been reading a lot about relationships. I think if we as women want to have a meaningful relationship. We must first love our selves then and only then are we capable of loving another. And we then need to understand the Art of Communication. My guy would occasionally text me pictures when he was away on a business trip or when he was traveling to visit family. So one time I mentioned how I really appreciated him doing this and how much I enjoyed him sharing with me while he was gone. Now, he regularly texts me pictures from his trips and I make sure to comment on each of them, because I truly do appreciate that he shares his life with me, even when we aren’t together! Thanks, James. I was encouraged by that information on complimenting the little things. I did it unawares and I believe it will pay off. The guy is a friend but I love him so much. So I feel he noticed. Wow, thank you, James. Will work this idea on my partner, we are moving into a new cycle in our relationship. I like letting him know that I respect and love him, and how special he is to me.